Patrick Purvis, Chief Revenue Officer at DiscoverOrg and Bridget Gleason, VP of Sales for Logz.io and my regular partner, join me on this episode of #Accelerate! Patrick joined DiscoverOrg in 2011 as the 34th employee and third sales rep. He saw it as a resume-builder but learned a lot as they grew over seven years. They’ve acquired their biggest competitor and employ 500. Patrick believes DiscoverOrg has one of the greatest SaaS sales teams and marketing machines in the market. There is pressure on salespeople to be self-learners. DiscoverOrg is investing in training their salespeople with a Sales Enablement leader and Gong.io scorecards. 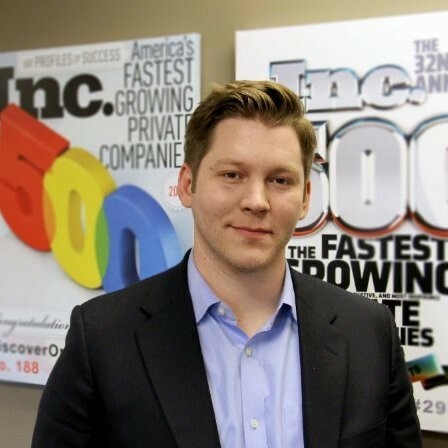 Patrick had two mentors — Henry Schuck, DiscoverOrg’s CEO and Steven Wernke, their number one account executive. DiscoverOrg’s target audience is sales and marketing leaders. Patrick learns from his customers. The Challenger Sale is the sales book that was most influential for Patrick. Another influential book he’s reading now is Thinking, Fast and Slow. According to Brian Tracy, if you read 12 books a year in your chosen field, you join the top 1% of experts about it. How do we motivate people to do that? Reading, in general, has a massive impact on your vocabulary. Millennials read less than other generations because they are more influenced by screens. Patrick would like them to pick up and enjoy a physical book, whatever it may be. Patrick looks for values, character, grit, and work ethic, in the interview process but the interview process is flawed for hiring. DiscoverOrg uses the OmniaGroup math and verbal cognitive test to select for interviews. DiscoverOrg hires SDRs and promotes them to Account Executives after about a year. Hitting the numbers is the top factor. Next, are they good people? Do they help others around them succeed? Do they have good ideas? DiscoverOrg is experimental. The system they’ve built can withstand new players and change. Patrick notes some statistics about their process. It starts with hiring the right people. Don’t select hires from a small candidate pool. At the time of the interview, it is Spring in Boston. Bridget is happy with it. The topic is how to increase your close rate from 20% to 25%. Andy had an interview recently with a CRO who hadn’t even thought about that. Instead, he wanted to fill the funnel with brute force instead of increasing the rate. Sales asks Marketing for more leads and Marketing asks Sales to close the leads they get. You have to start closing business, not burning leads. Bridget stresses getting better-qualified leads in the top of the funnel. Andy states that a 20% close rate is unacceptable. The SDRs need to filter out the unqualified leads to avoid wasting the Account Executives’ time with bad leads. Bridget wants to the increase the closes at every step. In SaaS, there is an unwarranted acceptance of a 20% close rate. No one has an infinite market size. Eventually, you will run out of large numbers of leads to fill the top of the funnel. Bridget calls this scorched earth. The way it works now is not the way it’s always going to work. Today’s methods will change as the world changes. To Bridget, innovation is the fun of sales. She likes a tight alignment between marketing and sales. A VP of Sales told Andy that their low close rate was due to too much competition. Andy reflects that they didn’t have a handle on discovery to find good fits for their product and service. They were not qualifying prospects. Sales is a numbers game, but find out which “numbers” are not a good fit. Bridget talks about Logz.io recently hiring a CMO. They are taking a more targeted approach on a smaller number of accounts. It’s sustainable. Andy has talked to a lot of Sales Managers who don’t like to sell to customers. They like the sales machine process and dashboards, instead. Bridget loves the ‘hands-on piece’ of sales, which is why she likes smaller companies. This is Bridget and Andy’s 137th episode together. Come back next week for another Wiley Wednesday (as Bridget calls it).